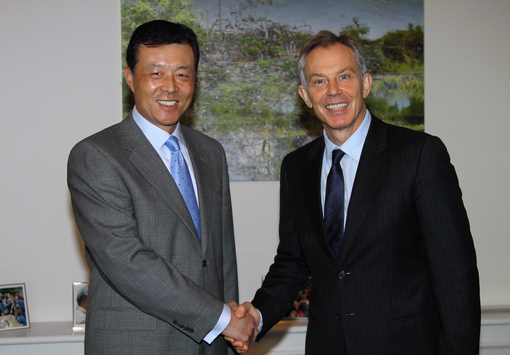 On March 31, Ambassador Liu Xiaoming called on former British Prime Minister Tony Blair. Blair extended warm welcome to Ambassador Liu for his assumption of office in the UK. He said that he just returned from an impressive visit to China. He has been paying close attention to the development of China and visited China almost every year in recent years. In each visit he can truly feel the new changes in place and see a China that is with strong development momentum and always full of vigour. He believes that it is essential for the world’s new generation of leaders to have better knowledge and understanding on China. In today’s rapidly changing world, China and the West should be prudent in dealing with the evolution of their gaps in understanding and should make efforts in maintaining and developing a mutually beneficial and win-win partnership. He believes that regardless of the outcome of the British general election, the policy of British Government to actively develop relations with China will not change, and any party will work for strengthening exchanges and cooperation between the two countries. Ambassador Liu appreciated Blair’s long-standing commitment to the development of the China-UK relations and spoke highly of his efforts in enhancing the understanding on China among the British public. He pointed out that China and the UK are strategic partners and that maintaining and developing their relations are not only in the fundamental interests of the two peoples, but also conducive to the world peace and stability. He said that since taking office, he has called on people from the British Government, the Parliament, the three major political parties and the business community, and it is the most impressive to him that people from all walks of life, both in and outside the British government, put strong emphasis on the China-UK relations and hopes to strengthen the exchanges and cooperation between the two countries. This gives him a strong confidence on maintaining a sound and stable development of the bilateral relations after the British general election. Ambassador Liu hoped that Blair will continue to care for and support the development of the China-UK relations and to make new contributions to promoting the understanding and cooperation between China and the West. Ambassador Liu also thanked Blair for his long support to the work of the Chinese Embassy in the UK and said that he hopes to continue to receive Blair’s support and help during his tenure. Blair said he was willing to continue his unremitting efforts for the development of the China-UK relations and looked forward to maintaining a good working relationship with Ambassador Liu, and wished Liu a success in his work in Britain. The two sides also exchanged views on the international issues of common concern.